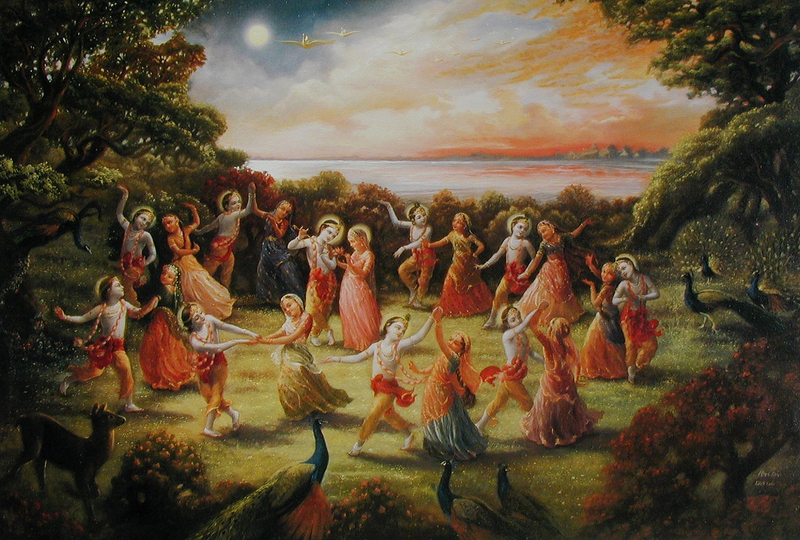 Sri Krishna Madhura Utsava is another celebration of the rasa dance, in which Krishna dances with many of His cowherd girlfriends in the moonlight, on the banks of the river Yamuna in Vrindavan. There are various festivities where Lord Krishna's rasa lila is celebrated - this festival being just one of them. The purnima or full moon of Damodara month is the second full moon of the autumn season, and rasa lila is again celebrated. This second rasa yatra is celebrated more in Bengal, whereas the first one is celebrated more in Vrindavana. On this day one should perform full worship of Radha and Krishna with many flowers, and place them in a rasa-mandala surrounded by the gopis.